Watch for updates to this site coming SOON ! News: I was saddened to learn that Ghost Band singer Jon Wearing is deceased. Watch for a tribute on this site. Photo by Becky Romine George Kerby is a journeyman musician from Detroit. He was a member of the notorious 1970s Cass Corridor bands The Lords, and The Inside/Outside Band, and has worked with such notable artists as Percussionist Extraordinaire Muruga Booker, jazz legend Frank Isola, blues pioneer Bobo Jenkins, jazz master and session musican Bobby McDonald, virtuoso harmonicist Peter Madcat Ruth, veteran jazzman Ralph Koziarski, guitarist/composer Rob Abate, perennial DownBeat Poll winner clarinetist Perry Robinson, tabla master Badal Roy, and The Original Raga-Rocker Ted Lucas to name a few. 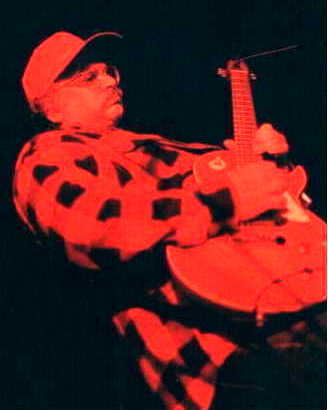 The 1980s found George in California where he was a regular at the jam sessions at Berkeley's famed Ashkenaz, and San Francisco's North Beach blues clubs before landing the bass chair with Alesia Panajota. Returning to Michigan in 1990, he became an integral member of The Ghost Band, and for several years was a core member of Muruga's Global Village Band and Free Funk, playing on the latter's self-titled debut Qbico LP .